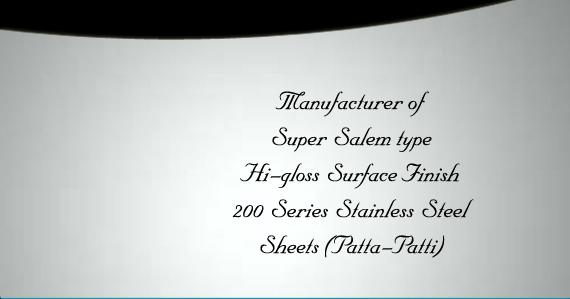 Manufacturers of premium quality super salem type surface finish 200 series stainless steel sheets (patta-patti) of JIN, NICE, ECO, JAPAN, AAA, COROL brands. These brands are manufactured out of Stainless Steel Flats containing approximately 0.2% Nickel. They are useful for flatware or shallow draw items. They are available as Sheets (Patta), or in shape of Blanks (Rectangle or Square), Circles; of thickness from 10 guage (3.25 mm) upto 29 guage (0.35 mm); in width or diameter of 8 inches to 28 inches; in 2D, 2B & Matt Finish. This brands are manufactured out of Stainless Steel Flats containing approximately 0.6% Nickel. They are useful for medium draw items. They are available as Sheets (Patta), or in shape of Blanks (Rectangle or Square), Circles; of thickness from 10 guage (3.25 mm) upto 29 guage (0.35 mm); in width or diameter of 8 inches to 28 inches; in 2D, 2B & Matt Finish. This brands are manufactured out of Stainless Steel Flats containing approximately 0.8% Nickel. They are useful for medium deep draw items. They are available as Sheets (Patta), or in shape of Blanks (Rectangle or Square), Circles; of thickness from 10 guage (3.25 mm) upto 29 guage (0.35 mm); in width or diameter of 8 inches to 28 inches; in 2D, 2B & Matt Finish. This brands are manufactured out of Stainless Steel Flats containing approximately 1% Nickel. They are useful for deep draw items. They are available as Sheets (Patta), or in shape of Blanks (Rectangle or Square), Circles; of thickness from 10 guage (3.25 mm) upto 29 guage (0.35 mm); in width or diameter of 8 inches to 28 inches; in 2D, 2B & Matt Finish. This brands are manufactured out of Stainless Steel Flats containing approximately 1.5% Nickel. They are useful for extra deep draw items. They are available as Sheets (Patta), or in shape of Blanks (Rectangle or Square), Circles; of thickness from 10 guage (3.25 mm) upto 29 guage (0.35 mm); in width or diameter of 8 inches to 28 inches; in 2D, 2B & Matt Finish. of JIN, NICE, ECO, JAPAN, AAA, COROL brands.